PerCP Conjugation Kit ab102907 uses a simple and quick process to conjugate an antibody to PerCP. It can also be used to conjugate other proteins or peptides. 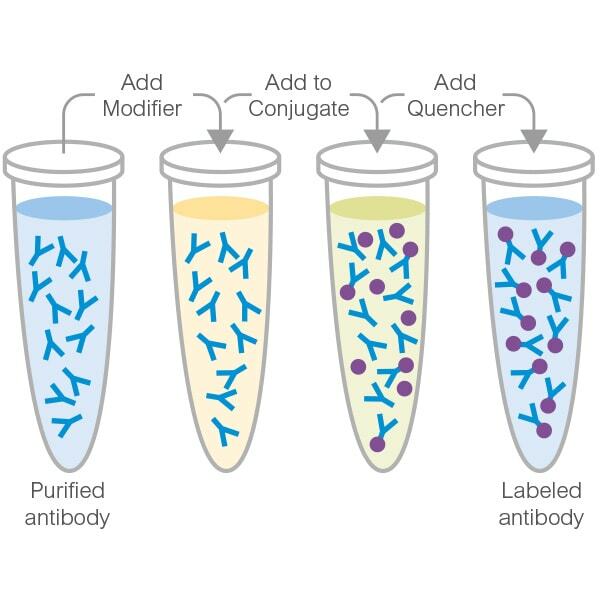 Learn about buffer compatibility below; for incompatible buffers and low antibody concentrations, use our rapid antibody purification and concentration kits. Use the FAQ to learn more about the technology, or about conjugating other proteins and peptides to PerCP. Our Abpromise guarantee covers the use of ab102907 in the following tested applications. Has 100 ug of a protein in 250 uL. How should protocol be modified? The first step says to add 10 uL of modifier to 100 uL of antibody- should 25 uL be added since 250 uL of antibody is used? Thank you for your call yesterday and for your patience while I have been in touch with the scientists in the lab regarding your enquiry. My colleagues have pointed out that the protein should be concentrated for the best results. The entire 250 uL should not be added to the single 100 ug vial of conjugate even though the protein is less concentrated. The conjugation will not work with 250 uL of sample volume. If the protein can not be concentrated, you can try with the dilute protein but the 250 uL will need to be split over the multiple vials of conjugate, so that no more than 100 uL will be added per vial. This should give some conjugated product but please note that the results will not be optimal. I hope this information will be useful, but please let me know if you have any further questions or need anything else regarding these kits, and I will be happy to help. Have a nice day.